It’s past midnight but we just got back to Joelle’s l’Atelier and downloaded some photos of this evening. I’m going to post a few before collapsing into bed – Franck is off again to go carrousing with Nicolas so I’m not going to wait up. This is where we had dinner. I’m going to do a proper review when I get home to my computer. This is what the atmosphere is like – you can’t get more of a traditional Parisian brasserie, including getting yelled at by the waiters if you appear too eager to please or slow-witted. Here’s me, patently very happy to be out on the town for an evening with my husband and only the glow-worm kicking and doing somersaults in my stomach in the way of children. Here was our bill written on the paper tablecloth. It looks like a lot but only came to 49 Euros and some centimes for the both of us. Here’s a photo I took of us driving around the deathtrap that is the Arch de Triomphe afterwards – Franck can’t resist having a drive around it every time we come to Paris just to confirm that he still has that French driving edge. We are still alive, so I can confirm that he does. And lastly, because I’m yawning and the tres comfortable bed upstairs is beckoning, here’s my head in front of the Eiffel Tower, a sight that always makes me want to pinch myself and say “I’m really in Paris” no matter how many times I see it. This entry was posted in Uncategorized on October 31, 2007 by admin. 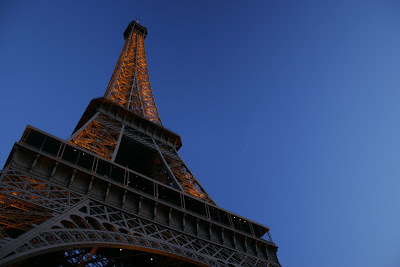 We’ll be in Paris for four days visiting with our friends Nicolas and Joelle and their children Valentin and Violette. Joelle has recently finished renovating and equipping a fabulous studio she rents out as a vacation rental in their quartier of Montparnasse, and it happens to be in the same building that Gauguin and Modigliani had their studios. Joelle has very generously offered to have our girls overnight in their apartment while Franck and I enjoy the bohemian life in the studio tous les deux. This entry was posted in Uncategorized on October 29, 2007 by admin. Camille and Charlotte “practising” on our walk around the Mont Saint Victor this morning. So to sum it up, our initial plans to have a third child following quickly on Camille’s heels was delayed by our exhaustion and by what my friend Andrea terms as “that nutbar phase” that many women experience at some point along the motherhood path. By the time we were seeing a glimmer of light at the end of the tunnel our plans to move back to France for a few years were well underway. Franck and I had often talked about the possibility of having the girls go to school in France for a few years to really learn French properly and to appropriate their father’s culture in a way that just can’t be done on vacations, and it was finally going to become a reality. Before we had lacked a framework for our stay in France, but on our last trip we had convinced the mule-ish owner of what has since become La Maison de la Vieille Vigne to sell the cottage to us after years of phoning him every time we were in France to see if he was interested. We knew we had to be in France for at least a year to transform the unused, dark, and nonfunctional little house into the vacation rental in our dreams. So just when I was getting to the end of the tunnel we undertook a major move with a two and a four year old in tow. Although the move was our dream there is no doubt that it took us a good year to get set up and to get in a position of being able to enjoy life over here. That may seem like a long time, but in my experience it more or less always takes a year to set up a work routine and a network of friends – two things that for me are absolutely essential to enjoying myself no matter where I am. So time marched on, and Camille and Charlotte got older, and the gap between them and a hypothetical third child got wider and wider until both Franck and I started to wonder if it wasn’t prudent to just stop where we were. Besides, things became so much easier. We no longer had to put out backs out hauling backpacks full of baby food and diapers on our frequent trans-Atlantic flights, the girls started to play together for hours, leaving us to work or veg out on the couch with a book (paradise! ), and we also got very used to sleeping a solid 8 hours every night. Yet I still couldn’t shake the feeling that there was still another child of ours out there and that our family wasn’t complete without him or her. If I had stayed in Canada rather than France I’m not sure I would have, at this relatively late juncture in the game, thrown my dice back in again. There was no doubt about it – logic and reason were clearly stacked against the decision to have a third. For one thing, we bought a smallish three bedroom house shortly after our arrival here in France (the interest rates were too ridiculously low for me to consider renting, but we have been living in a bit of a dump for the past three years while we create lovely places for other people to stay in, but I’m getting off track…). The girls share one bedroom, our office takes up the second, and Franck and I sleep in the third. Let’s just say a baby and all its attendant paraphernalia is going to make things more than “cozy”. Secondly, while running three vacation rentals is something Franck and I love doing most days, the path to material riches it is not. Buying a larger house or adding to this one in the foreseeable future is out of the question. Then there’s the cost of diapers, formula, and that fifth airline ticket when our newest addition hits two to consider. Also, this time around I know for certain that getting this baby out of me will require, not to put too fine a point on it, having my stomach cut open. For Charlotte the Cesarean came as a total shock, for Camille I had the luxury of holding out a bit of hope until the end that things would be different, but this time I can harbour no such illusions; two C-sections automatically means a third. Having been through it twice I knew exactly what I would be getting myself into, and if you can breeze into abdominal surgery without a tremble then I’d like to borrow some of your courage please. 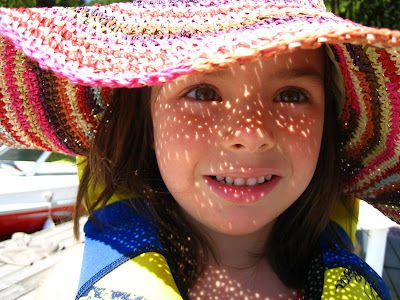 All of these factors seemed like good reasons not to have another child and yet, yet, yet…I still had that nagging instinct that twenty years down the road these reasons wouldn’t seem as good as they did in the present; living in France encouraged me to trust this little voice. 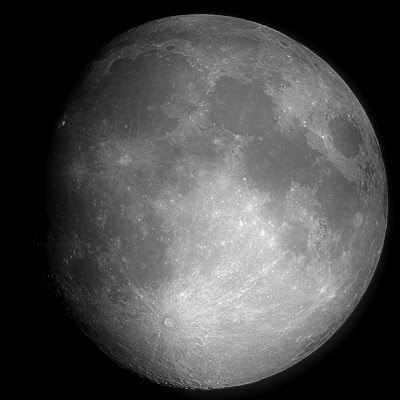 It was the Apollo 15 Mission! Unfortunately it doesn’t look like we’re going to make it to Nuits this weekend. We had a busy day yesterday with lots of Birthday Parties to chauffeur the girls to, last night we had our niece Lola over for crepes and carving pumpkins (I always feel the need to assert my North American-ness around Halloween, which has always been one of my favorite holidays) and today is the big family Birthday party for our niece Lola at my sister-in-law Stephanie’s house. Steph’s planned an Alsatian themed menu – tarte au munster to start, then a massive choucroute (sauerkraut and all sorts of charcuterie), and everyone is bringing a tarte or gateau for dessert. I don’t think we’ll be able to breath, let alone go down to Nuits-Saint-Georges after that. But I hope many people went to La Fete du Vin Bourru or or going today – it’s a gorgeous, sunny crisp Fall day – perfect for winetasting! This entry was posted in Uncategorized on October 26, 2007 by admin. 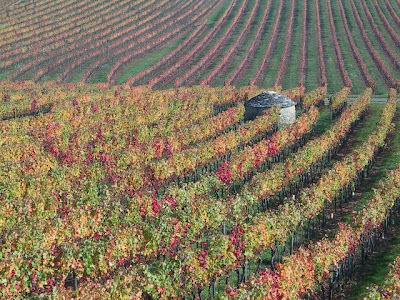 I know there are a few of my readers who are within striking distance of Burgundy, so I wanted to give them the head’s up for what is supposedly a great wine festival being held in the nearby town of Nuits-Saint-Georges this weekend (the 27th and 28th of October). The festival is called “La Fete du Vin Bourru“. Vin Bourru is the freshly squeezed juice that comes from the grapes harvested less than two months ago, and which is on its way to becoming wine. There will be a lot of this nectar a’ flowing, as well as the other wines for which Nuits-Saint-Georges is renowned (did you know that a bottle of Nuits-Saint-Georges was actually taken up into space by astronauts once? I’ll have to get back to you as to which particular mission) . As with many of these homegrown wine festivals here in Burgundy, there doesn’t appear to be any actual website for the event. However, if you just show up you will be pretty much guaranteed to have a blast. There will undoubtedly be good food (maybe some of those yummy waffles like at the Fete de la Patate http://grapejournal.blogspot.com/2007/10/la-fete-de-la-patate.html ), entertainment, and lotsa, lotsa good wine to drink. Here’s the only link I could find. It doesn’t tell much but you can trust me – Allez! For all you fellow lazy folk out there! Franck sent me some more lovely photos he took on his bike ride with Martial last Sunday. This is one of the stone cabottes that dot the vineyards around here. They were built a long, long time ago by the winemakers who needed a place to store their tools, not to mention wait out violent thunderstorms. 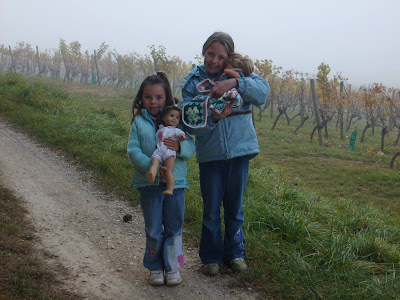 This particular one is in the vineyards between the villages of Villers-la-Faye (where La Maison de la Vieille Vigne is located, and where we live) and Chaux. 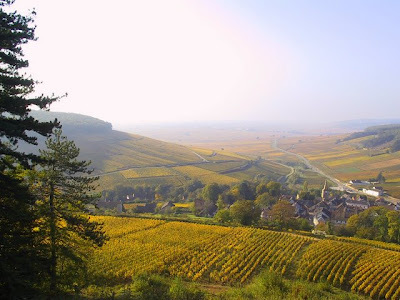 Here is the view out over the Corton-Charlemagne – the hillside where some of the best white wines in the world begin. The “Charlemagne” part of the name is because these whites were some of Charlemagne’s favorite wines. Of course that’s the exquisite village of Pernand-Vergelesses in the foreground. It’s only five minutes away from Villers-la-Faye and Magny-les-Villers so don’t miss going there for a visit (and why not a winetasting?) when you are at one of our village houses. 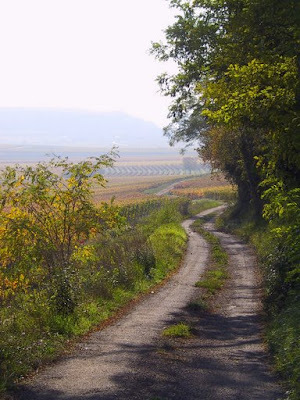 And here’s the kind of view you would see if you went out biking in the Fall here in Burgundy like my dear husband, rather than watching Scooby-Doo at home like me. This entry was posted in Uncategorized on October 24, 2007 by admin. Luckily I had a no-nonsense GP in Victoria who, when she saw the dire state I was in, promptly put me on Paxil and sent me to an excellent therapist. Digging myself out of that hole was a long, arduous process and probably one of the best but most difficult things I have ever done in my life (isn’t it interesting how usually the best things one accomplishes in life are the most difficult?). I gradually came to realize that the problem wasn’t Camille; the real sticking point was my belief that not only was I responsible for her unhappiness, but that it was in my power to make her content. This hit me like a thunderbolt, especially when I realized it’s larger implications – not only could I not be responsible for Camille’s happiness, but I also couldn’t be responsible for the happiness of everyone else around me either, as I had previously believed. This lifted a massive weight off my shoulders and marked the beginning of my road to rejoining the land of the living. After having at last gained some perspective on the Camille issue, I began to understand that my little girl had not in fact been swapped at birth by maleficent fairies, but that she was simply a very determined, independent little soul who was seriously pissed off about being a baby. Camille wanted to be big – she wanted to walk and talk and eat all by herself and as she had inherited her mother’s patience (or rather, the lack thereof) she wasn’t content sitting in her jiggly chair watching the rest of us doing these things. She wanted to join in, and RIGHT NOW! Screeching was the only way she had of expressing how cheesed off she was at the whole state of affairs. And magically, when she started talking at around two the hollering stopped. She became what she is now, one of the most self-contained, capable, not to mention happy little people in the world. Franck and his friend Martial have over the past six or so months gotten into the routine of going for a bike ride every Sunday morning. My only stipulation is that he go down to the village of Comblachien, where a boulanger is currently making some of the best baguettes I have ever tasted in my life, and get us some fresh bread for our morning tartines before riding off into the blue yonder. He and Martial are laughably well-suited as biking partners as they love nothing better than going further, higher, and faster than 99% of us other human beings on the planet. They also rather enjoy getting lost which is a good thing as it happens most Sundays. So they bike off while the girls and I laze around in our pyjamas and dressing gowns, munch tartines, and watch Scooby–Doo in French. But when Franck came back from his most recent ride with some lovely photos, it almost made me want to go with them…almost, but not quite. Besides, I’m pregnant. 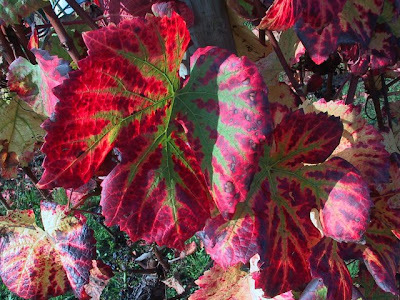 Here is a close-up of why the vineyards are so stunning this time of year in their Fall colours. 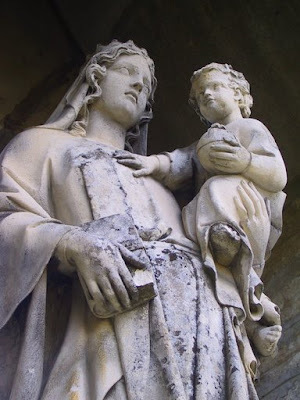 This is a statue of the Virgin that stands guard over the nearby village of Pernand–Vergelesses. 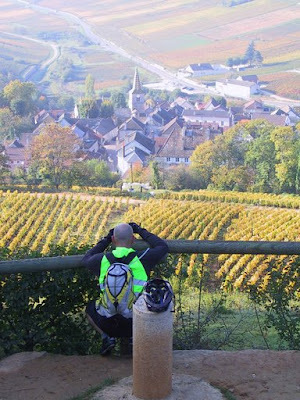 Here’s Martial taking a photo over the village of Pernand–Vergelesses and then out towards Beaune. The fluorescent yellow vest he’s wearing (Franck has a matching one – very cute) are so they are not mistaken by wine-sodden hunters for wild boars. And here’s Franck’s photo of Pernand and the vineyards beyond. Almost enough to make you want to hop on a bike Sunday morning, isn’t it? This entry was posted in Uncategorized on October 23, 2007 by admin. I should have been warned by the fact that in utero Camille did the rumba in my stomach all day and all night long, but at that juncture I was still under the misconception that, seeing I was such a good parent, I would inevitably get a smaller but equally mellow version of Charlotte for my second baby. Camille dispelled this notion from the second she emerged from the incision in my pelvis (I had two C-sections, and am gearing up for my third). She came out hollering like a drunken sailor on shore leave, and simply didn’t stop. Later on back at home from the hospital Franck, Charlotte, and I were all ground into despair by Camille’s enraged hollering which continued unchecked all day and all night long. I had her checked out by numerous doctors who could find nothing unusual with her, aside from an exceptionally healthy pair of lungs. The few friends or family who dared to cross the threshold of our house would leave (usually beating a hasty retreat after only a few minutes) pale, troubled, and murmuring that they had never heard a baby who could scream so stridently and for so long without a break. Camille’s constant discontent, combined with prolonged sleep deprivation, putting too much pressure on myself to “get back to normal”, the effort of pretending that everything was okay, not to mention caring for a toddler, finally manifested itself in the form of a hard-hitting anxiety disorder – panic attacks, agoraphobia…the whole nine yards. I felt like I was all alone in a black hole, and couldn’t find the way out. This entry was posted in Uncategorized on October 22, 2007 by admin. Just got back from a delicious outing to the not-to-be-missed Saturday market in Beaune. If you are here in Burgundy on a Saturday, either at Le Relais du Vieux Beaune or one of our village houses, here’s yet another reason not to miss it – we have recently discovered a new stall at the market selling what we believe just might be some of the best charcuterie in the world. It is called M.Sabatier, and is located just to the right of the poulet roti vendors (also a delicious stop) just around the corner from the Hotel-Dieu. And as Charlotte and Camille have discovered, they also give out generous free samples to children (and sometimes famished looking adults too…). This entry was posted in Uncategorized on October 20, 2007 by admin. 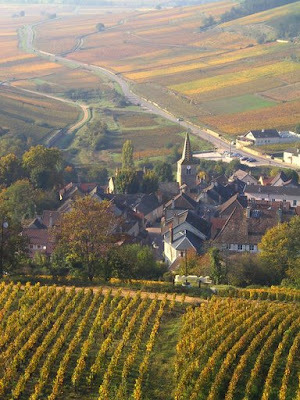 Burgundy and France Travel Info.